I’m going to blow your mind here: I’m a human being. I know, I know. There was some speculation because I’m a tall lady that I might be a giantess. Or a cylon or something. Yeah…I’m definitely not a cylon. Or, is that exactly what a cylon would want you to think? So, I’m a totally normal human being and I don’t really like to make mistakes. I think that’s a pretty normal thing. And of course, because I’m a regular ole cylon human being, I make mistakes more often than not. Here’s a mistake I made earlier this week: I misspelled Richmond. Yep. The city that I live in. I spelled it Richcmond. That’s not how it is spelled. But that will appear on the return address of a card I mailed out this week. Keep your eyes peeled, receivers of my correspondence. I made a lot of really bad food mistakes this weekend. I went with my new roommates best friends forever, Becca and Evan, to Broad Appetit. 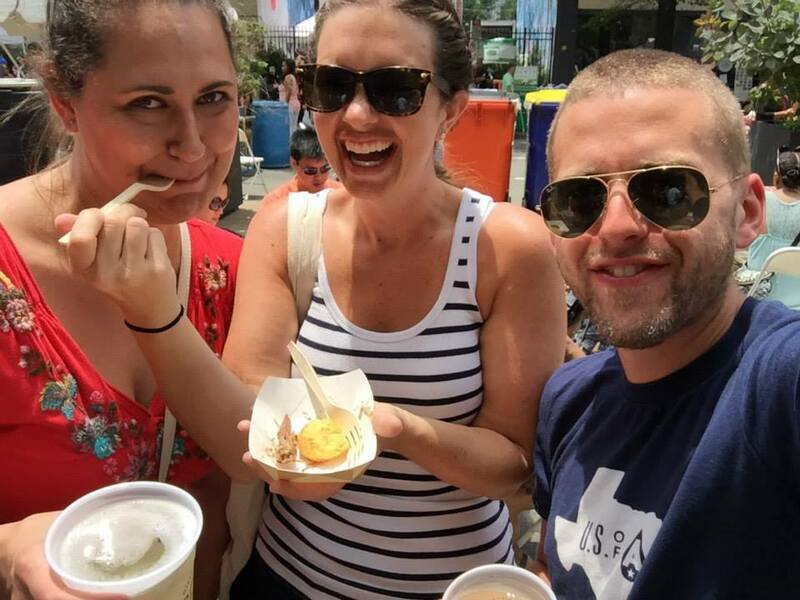 Broad Appetit is a lovely food festival on Broad Street here in Richmond with hundreds of vendors, live music and more cute puppies than you can shake (or throw) a stick at (or to). And for as many good decisions I made, l made some really terrible ones too. Without further ado: food things! 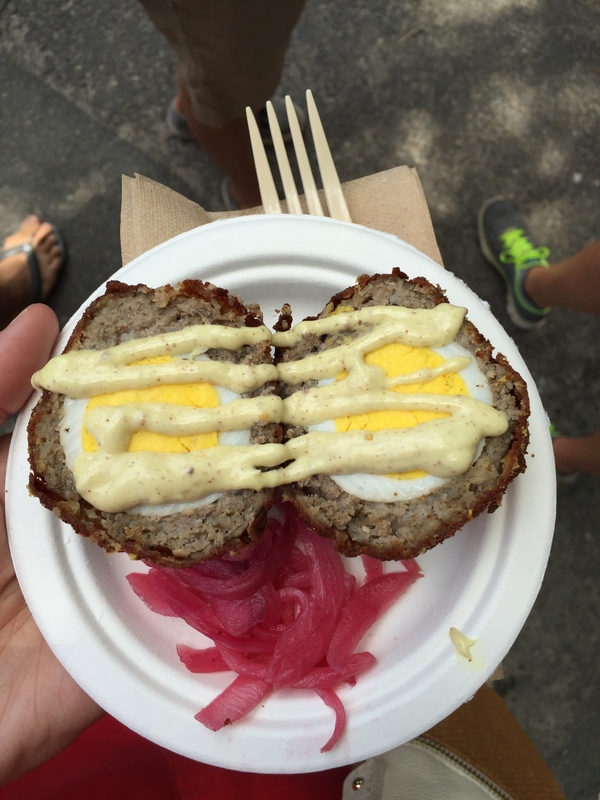 Good decision: Scotch egg from Somewhere. Fried and delicious. Only complaint. It was too big and therefore, too delicious. 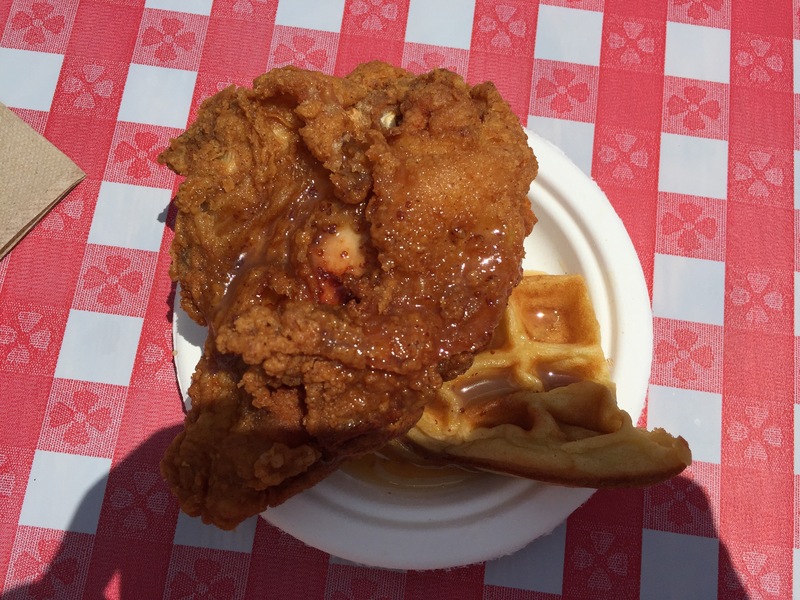 Good decision: Chicken and waffles with tahini maple syrup. I kept my shadow in the picture so you knew who took the picture. Sweet and crunchy. I want to marry chicken and waffles. I want to be Mrs. Chicken and Waffles. Or Ms. Novak married to Mr. Chicken and Waffles. It’s the 90s. Bad decision: This ramen situation. Cold ramen salad. My heart was cold eating it. 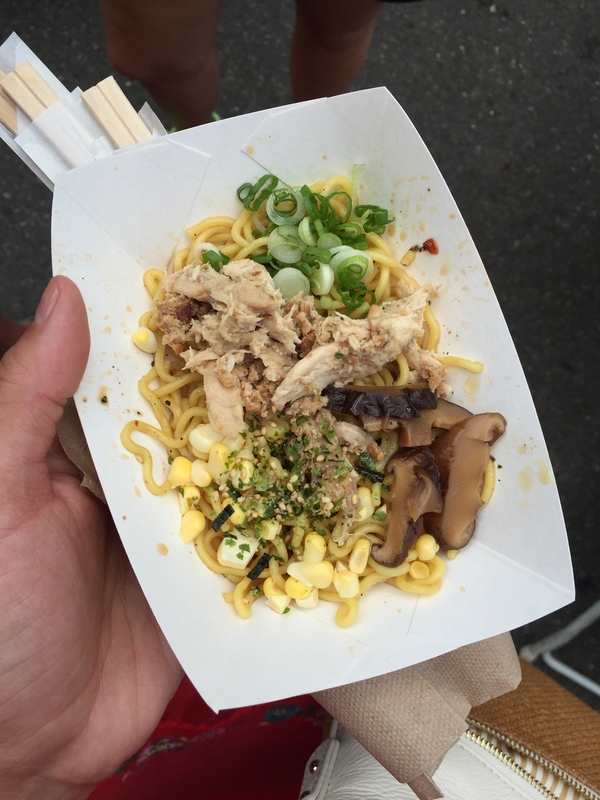 Listen, this ramen won the best dish of the festival. And I wanted to like it so much because these guys follow me on instagram so I feel like we should be friends. But, this was a cold ramen salad that needed a hit of heat or acid or something. Frankly, I wish I’d taken a hit of acid before I’d eaten it. Maybe that would’ve increased my enjoyment. But, I will go to the ramen joint and give them a proper chance when they are in their element. 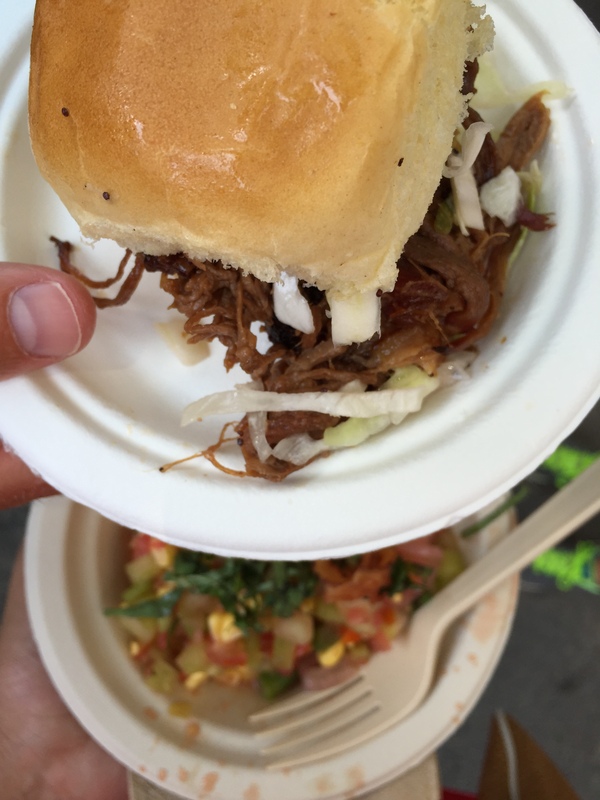 Good decision: Barbecue something with something. I don’t remember anything about this dish except that it lead to maybe my favorite picture of all time. Meet Drunk Sandwich. Coming to Instagram or Myspace or a blog near you. 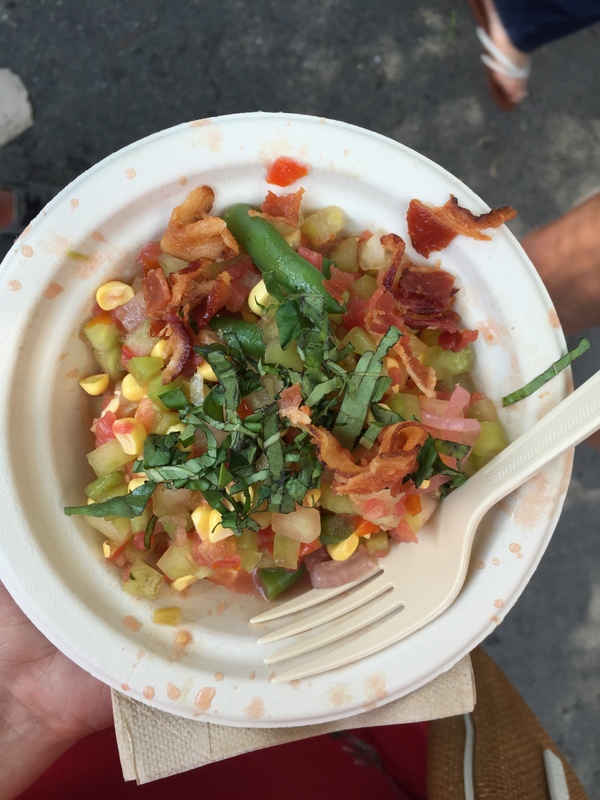 WORST DECISION: Summer Vegetable Bacon Salad. Shoulda been called water salad. I had been drinking drinks and eating fried things so I thought a summer vegetable salad with bacon sounded delightful. Light and refreshing and bacon-y. Well, sure. That was the theory. This was basically a watery pile of veggies topped with bacon. I returned it from whence it came: the garbaje. Ok, I get it. It’s better than what I got. I try to live my life without regrets, but it is Wednesday and I still regret not getting this slider. Evan got this slider. I wish I got this slider. 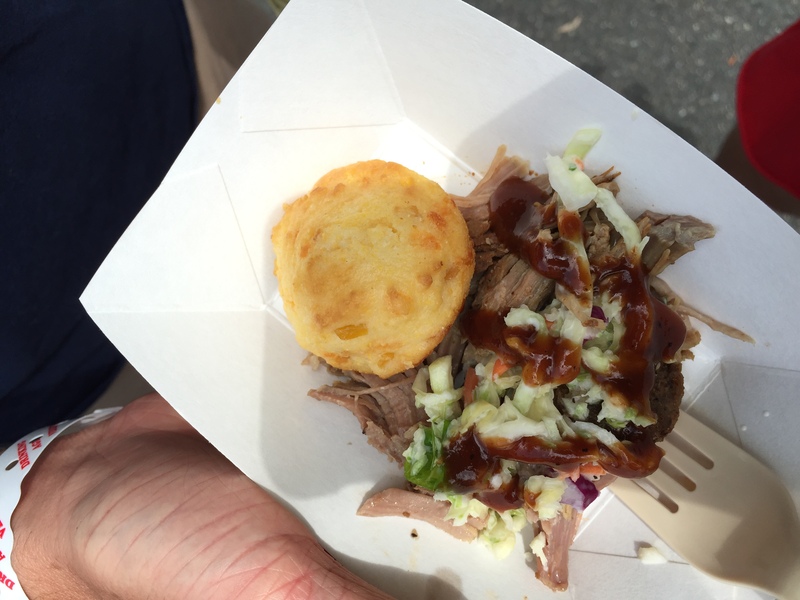 The meat was braised in Cheerwine. Thank God I’m going to North Carolina this weekend. 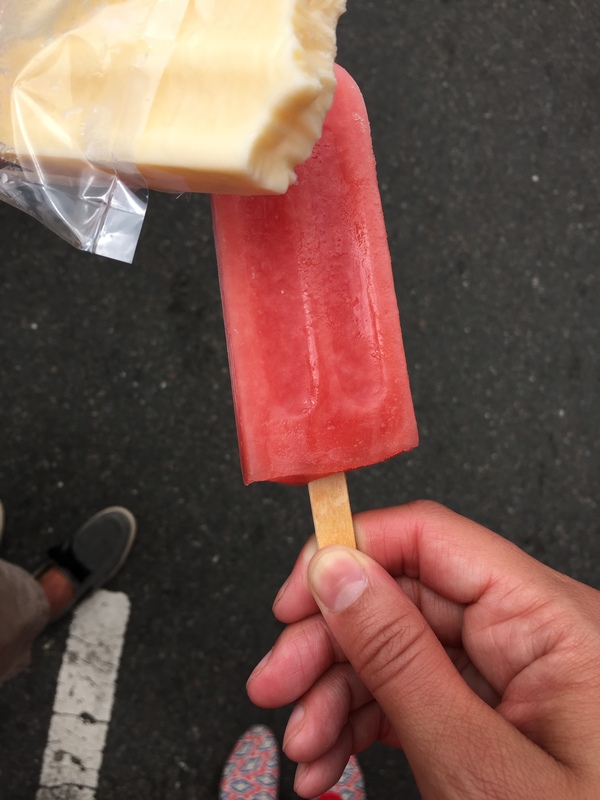 Good decision: Watermelon popsicle from King of Pops. 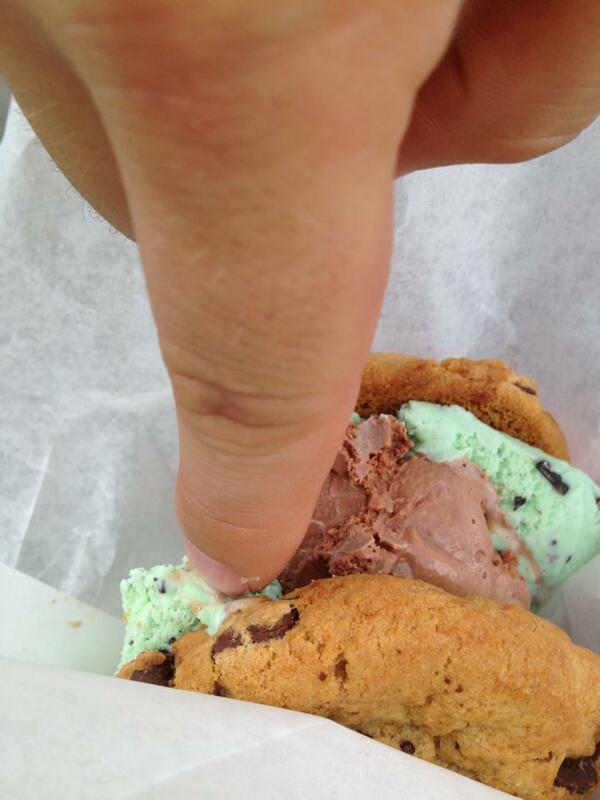 Perfect summer treat. Also, the guy at the cart was really sexual with how he opened the popsicles. It was awkward to watch. Also, Evan likes to ruin my pictures. Like another Evan I know. This sandwich was ruined. Evan Pease will rue the day he touched my iced cream. Overall, the day was a win even though it was punctuated with food misteaks.